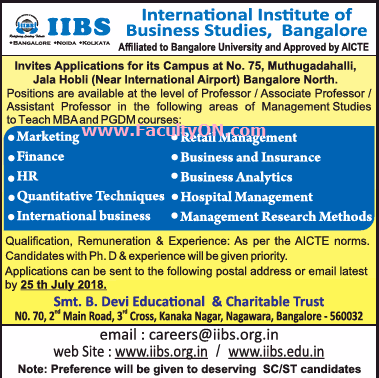 International Institute of Business Studies, Bangalore has advertised in THE TIMES OF INDIA newspaper for the recruitment of Professor / Associate Professor / Assistant Professor jobs vacancies. Interested and eligible job aspirants are requested to apply on or before 25th July 2018. Check out further more details below. College Profile: The International Institute of Business Studies is a Srimati B. Devi Educational & Charitable Trust campus located in Bangalore, Noida & Kolkata. It was established in 2001 by Dr.Jay Prakash. Qualifications: As per AICTE norms. Candidates with Ph.D & experience will be given preference. How to Apply: Interested and eligible candidates are requested to send their application with CV, copies of certificates and recent PP size photo to the following email or postal address.